We offer relays that can be controlled by a time delay or boards that know what time and day it is and you can simply schedule a time for the relay to come on and turn off. A relay can turn on with a touch of a button on your desktop, a program that you write or by a Key Fob you hold in your hand. Key Fob Relays can can trigger time delay by simply pushing a button. The time delay can be activated thorough the included software or can be triggered by a sensor attached to the board. 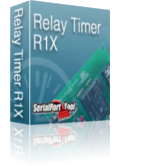 Time delay can be configured to trigger relays, events and timers using parameters that you determine. For example you can set the time duration, how long before the relay starts and how long it's activated. Time delay can be triggered with a computer through the included software or with a sensor connected to the board. Our Time Relay Series of controllers include an integrated real time clock so the board actually know what time it is. Use your computer to setup the time schedule and store your schedule into the time relay. Once stored, the Time Relay Controller does not require a computer, and will activate relays according to a schedule stored on the board that can be as simple or as complex as your application requires. Control relays when your time schedule matches the current year, month, day of week, calendar day, or Hour/Minute/Second. Activate relays only when the day is Monday, activate relays when the day is Monday and the Year is 2020, activate relays when the day is Monday, the year is 2020 at 9:44:21 AM. The Time Relay controller stores 999 events and controls up 256 relays. We Accept Visa, MasterCard, American Express, Discover, Paypal and Google Checkout through our shopping cart or simply call our office and give us your order over the phone. You can also fax us your order 24 hours a day with your payment information to 417-646-5662. Place your items into the shipping cart and select the fax option and we'll even make the fax order for you! Centrally located in the Midwest our office hours are 8:30 - 5:00 Central Time Monday through Friday. Calling after hours? Just leave a voice mail and we'll return your call or send us an email at: sales@ozarksav.com.